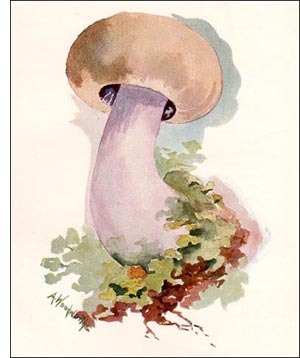 The Tricholoma of our illustration is one of the wellknown edible mushrooms. Many authors of writings on the food mushrooms speak highly of its esculent qualities. Its taste is pleasant and its flavor may be likened to that of veal. The Masked Tricholoma is generally found in rather open woods or on open, grassy places in the woods. It is a fall species, seldom appearing before the first of September, and it is then common, in favorable places, until the time of heavy frosts. In England the masked tricholoma is often called Blewits, and Dr. Peck tells us that it is called Blue Stem in France, although in our own country the plant has a more violet or lilac than a blue color. Its solid stem is short and stout and not infrequently bulbous at the base. In color the stem is whitish, tinged with lilac or violet, and when young there are fibrils on its surface which quite disappear as the mushroom grows older. Usually the masked tricholoma is solitary in its growth, but it is also found in groups or even in clusters of several individuals. When young the cap is convex and quite firm, but as it grows older it becomes flat and flabby, and the margins may become wavy. The margin of the caps of miniature plants is incurved and not infrequently covered with whitish particles or with a fine bloom. The cap varies in color, but is generally some shade of tan, gradually changing into a pale lilac near the edge.